Would you like to add a laminated scoring table to your order so that you score your games of Chicago correctly? We have two sizes: Pocket (business card) size and Large (A5) size. Buy a Simon Lucas pad of wide Chicago score cards and play this popular version of the game. We print our score cards on quality 135gsm card. We make them into pads with a back board to lean on and a cover to keep them clean. 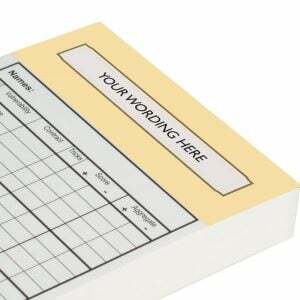 A pad keeps the score cards neat and tidy. You never have to worry about loose score sheets getting tatty and damaged in storage again! We make our wide Chicago score cards from 135gsm card so you can either give each player their own pad or a single score card. Moreover, each pad contains 50 double-sided score cards, which is 100 games per pad. 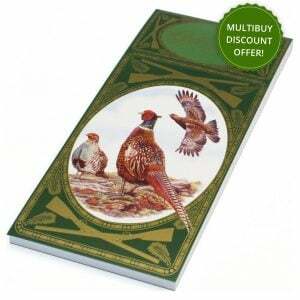 The score cards are a wider size than our usual range, so there’s more room to write. They measure 9.9 x 21cm (the same size as a standard compliments slip). Because of their larger size, these score cards DO NOT fit in any of our score card holders. While the basic elements of scoring are similar to rubber bridge, their method of accumulation and recording differ slightly, and honours do score. We include scoring tables for both Rubber and Chicago bridge in our Contract Indicator and Scoring Aid. Does what it is meant to do, good quality.